Q: How much sugar do people typically consume? A: On average, Americans get about 16% of their daily calories from added sugars, according to the Food & Drug Administration. While many foods naturally contain sugar, a lot more sugar is added to processed foods. For example, a 12-ounce can of cola contains seven teaspoons of sugar, although you might not see that word on the label. 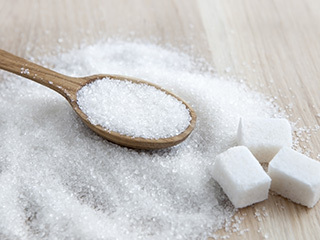 Other names for added sugars include high-fructose corn syrup, fruit juice concentrate, molasses, honey, and sucrose. Even foods that you wouldn’t think of as sweet have added sugar, often in the form of high-fructose corn syrup. High-fructose corn syrup is a preservative, giving packaged foods a longer shelf life, and it plays a role in color and texture. Q: 16% added sugars sounds like a lot. Are we eating too much? A: Faced with mounting evidence about sugar’s harms, the 2015 Dietary Guidelines Advisory Committee has recommended that people limit added sugars to a maximum of 10% of their total daily calories. Q: If I want to reduce my sugar consumption from 16% to 10%, how much sugar is that? A: On a 2,000-calorie-a-day diet, that equals 12 teaspoons of sugar. Q: Is added sugar a health concern? A: Added sugars probably have a greater impact on high blood pressure (hypertension) than does sodium, and fructose in particular may increase cardiovascular (heart and blood vessel) risk. There’s evidence that added sugars, especially sugar-sweetened drinks, raise the risks of excess weight and obesity, as well as type 2 diabetes. And, of course, sugar is a major contributor to tooth decay. Q: How can I reduce added sugar in my diet? Drink water or other calorie-free drinks instead of sugary, non-diet sodas or sports drinks. That goes for blended coffee drinks, too. When you drink fruit juice, make sure it’s 100 percent fruit juice — not juice drinks that have added sugar. Choose breakfast cereals carefully. Although healthy breakfast cereals can contain added sugar to make them more appealing to children, skip the non-nutritious, sugary and frosted cereals. Opt for reduced-sugar varieties of syrups, jams, jellies and preserves. Use other condiments sparingly. Salad dressings and ketchup have added sugar. Buy canned fruit packed in water or juice, not syrup. Enhance foods with spices instead of sugar. Try ginger, allspice, cinnamon or nutmeg. For a list of common foods and the amount of sugar they contain, see this article in Medical News Today. 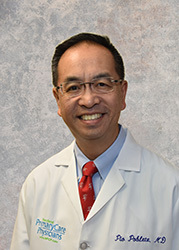 Dr. Pio Poblete is an MPCP partner and practices in our Columbia office. He is certified by the American Board of Internal Medicine.